500 Days Of Film Reviews Sicario And Finds A Stunning And Tense Film About The US Response To Mexico’s Drug Cartels. FBI Agent, Kate Macer, is asked to join a special inter-agency task force in order to disrupt a powerful and dangerous Mexican drug cartel. However, the mission's objective is unclear and nothing is as it seems. Kate soon starts to doubt her role and the entire operation. Sicario is incredibly tense from its very opening seconds. First, you become aware of an insistent, pulsing beat and then the film opens with a washed out shot of Phoenix Arizona. The pulse quickens as the film cuts to a close up of FBI Agent Kate Macer (Emily Blunt). She is wearing full police protective gear and is sitting in an armored van. Blinding light from the van’s windows flashes over her and, as the music mixes with the sound of the engine, we know something dreadful is about to happen. Barely ten minutes into Sicario, director Denis Villleneuve, forces us to stare straight into the horrific abyss created by the Mexican drug cartels. It is a tough watch. We learn that Kate Macer has been in charge of an FBI kidnap response team for three years. Her outstanding work has brought her to the attention of Matt Graver (Josh Brolin) - particularly following her most recent, nightmarish raid. Graver needs her as a liaison for his mission to pursue a senior figure in a Mexican drug cartel. Macer is told that his inter-agency task force requires her tactical experience and expertise in responding to escalating cartel activity. Kate accepts - she wants to get the people responsible for the horrors she has seen. I thoroughly enjoyed Sicario. I missed this film when it was released in cinemas. And for that I am really sorry. Sicario is a film that deserves to be seen on the big screen. Okay, it doesn’t have grizzly bears and vast, brutal landscapes like The Revenant. No, it doesn’t take us up Mount Everest (like Everest) and, well, no it doesn’t take us to Mars (like The Martian). I should have seen Sicario on the big screen because every frame of this film is stunning. Director of photography, Roger Deakins, makes full use of light and shade, colour and tone. Every single shot in Sicario is wonderfully composed. I have watched Sicario twice now and I am just so overwhelmed by how this film looks and (together with Jóhann Jóhannsson’s intense score) feels. Deakins’ cinematography is as important as the script and the film’s performances in telling this dark story. Sicario has an impressive cast and they are all superb. Josh Brolin is wonderfully relaxed (check out those flip flops) in what is an extremely tense situation. His reactions often feel chillingly inappropriate. 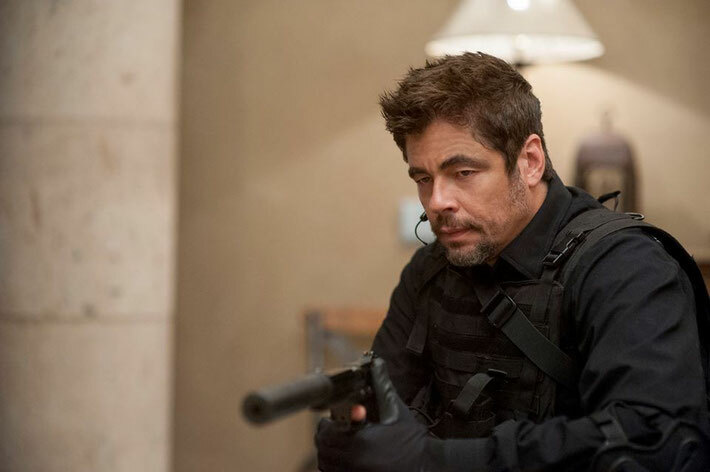 Meanwhile, Benicio Del Toro is effortlessly brilliant as the mysterious and dangerous Alejandro. With just one look, he conveys so much dark menace. His is the performance that will stay with me. However, of course, the events that unfold in Sicario are seen through the eyes of Kate Macer. When she is kept in the dark, so are we. Her confusion is our confusion. Her horror is ours. Emily Blunt gives a phenomenal performance and keeps this film together. She is utterly convincing and I really cared about her. I feel that she deserves far more recognition for this role. As much as I enjoyed Sicario, I also felt that this movies has problems. For example, the storytelling breaks down in the final act of the film. By the end, I was aware what Sicario wanted me to feel but felt that the movie had failed to get me there. In addition, and through no fault of Blunt’s, Macer behaves in ways that just do not ring true. She makes some foolish decisions for someone with her experience - even given her idealism. I also found it frustrating that Macer was so passive. Yes she holds her own but she doesn’t get to display her skills or expertise at any point. I (sort of) understand why, plot-wise, this is the case but I still wish she had a more active part. The problem may be that I have seen documentary Cartel Land - this film has a similar story to tell, a similar point to make. And for me, Cartel Land does it better. However, these are small issues. Overall, Sicario is a great film. It is tense and exciting to watch (particularly during the incredible traffic jam). It is frightening, horrifying and, tragically, all too real. 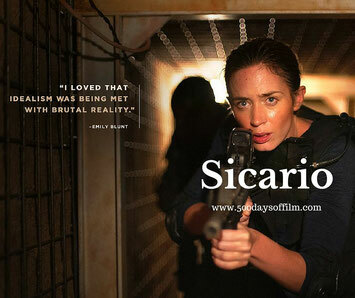 The word sicario, according to the film, comes from the zealots of Jerusalem and is used to describe the killers who hunted the Romans who invaded their homeland. In Mexico, the word means hitman. Denis Villeneuve has revealed that Sicario’s producers wanted him to rewrite Emily Blunt’s role for a man. Thankfully, the filmmakers stuck to their guns. If you have, what did you think of this movie?